"BeiDou" redirects here. For other uses, see Beidou (disambiguation). The BeiDou Navigation Satellite System (BDS) (Chinese: 北斗卫星导航系统; pinyin: běi dǒu wèi xīng dǎo háng xì tǒng [pèi tòu wêi ɕíŋ tàu xǎŋ ɕî tʰʊ̀ŋ]) is a Chinese satellite navigation system. It consists of two separate satellite constellations. The first BeiDou system, officially called the BeiDou Satellite Navigation Experimental System and also known as BeiDou-1, consists of three satellites which since 2000 has offered limited coverage and navigation services, mainly for users in China and neighboring regions. Beidou-1 was decommissioned at the end of 2012. The second generation of the system, officially called the BeiDou Navigation Satellite System (BDS) and also known as COMPASS or BeiDou-2, became operational in China in December 2011 with a partial constellation of 10 satellites in orbit. Since December 2012, it has been offering services to customers in the Asia-Pacific region. In 2015, China started the build-up of the third generation BeiDou system (BeiDou-3) in the global coverage constellation. The first BDS-3 satellite was launched on 30 March 2015. As of January 2018, nine BeiDou-3 satellites have been launched. BeiDou-3 will eventually consist of 35 satellites and is expected to provide global services upon completion in 2020. When fully completed, BeiDou will provide an alternative global navigation satellite system to the United States owned Global Positioning System (GPS), the Russian GLONASS or European Galileo systems and is expected to be more accurate than these. It was claimed in 2016 that BeiDou-3 will reach millimeter-level accuracy (with post-processing). According to China Daily, in 2015, fifteen years after the satellite system was launched, it was generating a turnover of $31.5 billion per annum for major companies such as China Aerospace Science and Industry Corp, AutoNavi Holdings Ltd, and China North Industries Group Corp.
On 27 December 2018, BeiDou Navigation Satellite System started to provide global services. The official English name of the system is BeiDou Navigation Satellite System. It is named after the Big Dipper asterism, which is known in Chinese as Běidǒu (Chinese: 北斗). The name literally means "Northern Dipper", the name given by ancient Chinese astronomers to the seven brightest stars of the Ursa Major constellation. Historically, this set of stars was used in navigation to locate the North Star. As such, the name BeiDou also serves as a metaphor for the purpose of the satellite navigation system. The first satellite, BeiDou-1A, was launched on 30 October 2000, followed by BeiDou-1B on 20 December 2000. The third satellite, BeiDou-1C (a backup satellite), was put into orbit on 25 May 2003. The successful launch of BeiDou-1C also meant the establishment of the BeiDou-1 navigation system. On 2 November 2006, China announced that from 2008 BeiDou would offer an open service with an accuracy of 10 meters, timing of 0.2 microseconds, and speed of 0.2 meters/second. In February 2007, the fourth and last satellite of the BeiDou-1 system, BeiDou-1D (sometimes called BeiDou-2A, serving as a backup satellite), was launched. It was reported that the satellite had suffered from a control system malfunction but was then fully restored. In April 2007, the first satellite of BeiDou-2, namely Compass-M1 (to validate frequencies for the BeiDou-2 constellation) was successfully put into its working orbit. The second BeiDou-2 constellation satellite Compass-G2 was launched on 15 April 2009. On 15 January 2010, the official website of the BeiDou Navigation Satellite System went online, and the system's third satellite (Compass-G1) was carried into its orbit by a Long March 3C rocket on 17 January 2010. On 2 June 2010, the fourth satellite was launched successfully into orbit. The fifth orbiter was launched into space from Xichang Satellite Launch Center by an LM-3I carrier rocket on 1 August 2010. Three months later, on 1 November 2010, the sixth satellite was sent into orbit by LM-3C. Another satellite, the Beidou-2/Compass IGSO-5 (fifth inclined geosynchronous orbit) satellite, was launched from the Xichang Satellite Launch Center by a Long March-3A on 1 December 2011 (UTC). In September 2003, China intended to join the European Galileo positioning system project and was to invest €230 million (USD296 million, GBP160 million) in Galileo over the next few years. At the time, it was believed that China's "BeiDou" navigation system would then only be used by its armed forces. In October 2004, China officially joined the Galileo project by signing the Agreement on the Cooperation in the Galileo Program between the "Galileo Joint Undertaking" (GJU) and the "National Remote Sensing Centre of China" (NRSCC). Based on the Sino-European Cooperation Agreement on Galileo program, China Galileo Industries (CGI), the prime contractor of the China’s involvement in Galileo programs, was founded in December 2004. By April 2006, eleven cooperation projects within the Galileo framework had been signed between China and EU. However, the Hong Kong-based South China Morning Post reported in January 2008 that China was unsatisfied with its role in the Galileo project and was to compete with Galileo in the Asian market. In November 2014, Beidou became part of the World-Wide Radionavigation System (WWRNS) at the 94th meeting of The International Maritime Organization (IMO) Maritime Safety Committee, which approved the "Navigation Safety Circular" of the Beidou Navigation Satellite System (BDS). At Beijing time 21:52, March 30, 2015, the first new-generation BeiDou Navigation satellite (and the 17th overall) was successfully set to orbit by a Long March 3C rocket. BeiDou-1 is an experimental regional navigation system, which consists of four satellites (three working satellites and one backup satellite). The satellites themselves were based on the Chinese DFH-3 geostationary communications satellite and had a launch weight of 1,000 kilograms (2,200 pounds) each. Unlike the American GPS, Russian GLONASS, and European Galileo systems, which use medium Earth orbit satellites, BeiDou-1 uses satellites in geostationary orbit. This means that the system does not require a large constellation of satellites, but it also limits the coverage to areas on Earth where the satellites are visible. The area that can be serviced is from longitude 70°E to 140°E and from latitude 5°N to 55°N. A frequency of the system is 2491.75 MHz. The first satellite, BeiDou-1A, was launched on October 31, 2000. The second satellite, BeiDou-1B, was successfully launched on December 21, 2000. The last operational satellite of the constellation, BeiDou-1C, was launched on May 25, 2003. In 2007, the official Xinhua News Agency reported that the resolution of the BeiDou system was as low as 0.5 metres. With the existing user terminals it appears that the calibrated accuracy is 20m (100m, uncalibrated). In 2008, a BeiDou-1 ground terminal cost around CN¥ 20,000RMB (US$2,929), almost 10 times the price of a contemporary GPS terminal. The price of the terminals was explained as being due to the cost of imported microchips. At the China High-Tech Fair ELEXCON of November 2009 in Shenzhen, a BeiDou terminal priced at CN¥ 3,000RMB was presented. Over 1,000 BeiDou-1 terminals were used after the 2008 Sichuan earthquake, providing information from the disaster area. As of October 2009, all Chinese border guards in Yunnan are equipped with BeiDou-1 devices. According to Sun Jiadong, the chief designer of the navigation system, "Many organizations have been using our system for a while, and they like it very much." The new-generation BeiDou satellites support short message service. 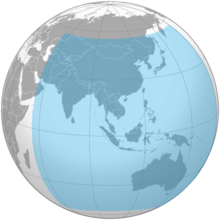 Coverage polygon of BeiDou-2 in 2012. BeiDou-2 (formerly known as COMPASS) is not an extension to the older BeiDou-1, but rather supersedes it outright. The new system will be a constellation of 35 satellites, which include 5 geostationary orbit satellites for backward compatibility with BeiDou-1, and 30 non-geostationary satellites (27 in medium Earth orbit and 3 in inclined geosynchronous orbit), that will offer complete coverage of the globe. The ranging signals are based on the CDMA principle and have complex structure typical of Galileo or modernized GPS. Similar to the other global navigation satellite systems (GNSSs), there will be two levels of positioning service: open (public) and restricted (military). The public service will be available globally to general users. When all the currently planned GNSSs are deployed, users of multi-constellation receivers will benefit from a total over 100 satellites, which will significantly improve all aspects of positioning, especially availability of the signals in so-called urban canyons. The general designer of the COMPASS navigation system is Sun Jiadong, who is also the general designer of its predecessor, the original BeiDou navigation system. Frequency allocation of GPS, Galileo, and COMPASS; the light red color of E1 band indicates that the transmission in this band has not yet been detected. There are two levels of service provided — a free service to civilians and licensed service to the Chinese government and military. The free civilian service has a 10-meter location-tracking accuracy, synchronizes clocks with an accuracy of 10 nanoseconds, and measures speeds to within 0.2 m/s. The restricted military service has a location accuracy of 10 centimetres, can be used for communication, and will supply information about the system status to the user. To date, the military service has been granted only to the People's Liberation Army and to the Pakistan Armed Forces. Frequencies for COMPASS are allocated in four bands: E1, E2, E5B, and E6 and overlap with Galileo. The fact of overlapping could be convenient from the point of view of the receiver design, but on the other hand raises the issues of system interference, especially within E1 and E2 bands, which are allocated for Galileo's publicly regulated service. However, under International Telecommunication Union (ITU) policies, the first nation to start broadcasting in a specific frequency will have priority to that frequency, and any subsequent users will be required to obtain permission prior to using that frequency, and otherwise ensure that their broadcasts do not interfere with the original nation's broadcasts. It now appears that Chinese COMPASS satellites will start transmitting in the E1, E2, E5B, and E6 bands before Europe's Galileo satellites and thus have primary rights to these frequency ranges. Although little was officially announced by Chinese authorities about the signals of the new system, the launch of the first COMPASS satellite permitted independent researchers not only to study general characteristics of the signals, but even to build a COMPASS receiver. Compass-M1 is an experimental satellite launched for signal testing and validation and for the frequency filing on 14 April 2007. The role of Compass-M1 for Compass is similar to the role of the GIOVE satellites for the Galileo system. The orbit of Compass-M1 is nearly circular, has an altitude of 21,150 km and an inclination of 55.5 degrees. Compass-M1 transmits in 3 bands: E2, E5B, and E6. In each frequency band two coherent sub-signals have been detected with a phase shift of 90 degrees (in quadrature). These signal components are further referred to as "I" and "Q". The "I" components have shorter codes and are likely to be intended for the open service. The "Q" components have much longer codes, are more interference resistive, and are probably intended for the restricted service. The investigation of the transmitted signals started immediately after the launch of Compass -M1 on 14 April 2007. Soon after in June 2007, engineers at CNES reported the spectrum and structure of the signals. A month later, researchers from Stanford University reported the complete decoding of the “I” signals components. The knowledge of the codes allowed a group of engineers at Septentrio to build the COMPASS receiver and report tracking and multipath characteristics of the “I” signals on E2 and E5B. In December 2011, the system went into operation on a trial basis. It has started providing navigation, positioning and timing data to China and the neighbouring area for free from 27 December. During this trial run, Compass will offer positioning accuracy to within 25 meters, but the precision will improve as more satellites are launched. Upon the system's official launch, it pledged to offer general users positioning information accurate to the nearest 10 m, measure speeds within 0.2 m per second, and provide signals for clock synchronisation accurate to 0.02 microseconds. The BeiDou-2 system began offering services for the Asia-Pacific region in December 2012. At this time, the system could provide positioning data between longitude 55°E to 180°E and from latitude 55°S to 55°N. In December 2011, Xinhua stated that "[t]he basic structure of the Beidou system has now been established, and engineers are now conducting comprehensive system test and evaluation. The system will provide test-run services of positioning, navigation and time for China and the neighboring areas before the end of this year, according to the authorities." The system became operational in the China region that same month. The global navigation system should be finished by 2020. As of December 2012, 16 satellites for BeiDou-2 have been launched, 14 of them are in service. And as of December 2017, 150m Chinese smartphones (20% of the market) were equipped to utilize Beidou. The third phase of the Beidou system (BDS-3) will include three GEO satellites, three IGSO satellites, and twenty-four MEO satellites which introduce new signal frequencies B1C/B1I/B1A (1575.42 MHz), B2a/B2b (1191.795 MHz), B3I/B3Q/B3A (1268.52 MHz), and Bs test frequency (2492.028 MHz). Interface control documents on the new open signals were published in 2017-2018. As of October 2018, fifteen BDS-3 satellites have been launched, and the new global constellation is expected to become operational by 2020. BDS-3 satellites also include SBAS and SAR capabilities. Code period, chips 2046 ?? 2046 ?? 10230 ?? Symbols/s 50 ?? 50 ?? 50 ?? Navigation frames, s 6 ?? 6 ?? ?? ?? Navigation sub-frames, s 30 ?? 30 ?? ?? ?? Navigation period, min 12.0 ?? 12.0 ?? ?? ?? Characteristics of the "I" signals on E2 and E5B are generally similar to the civilian codes of GPS (L1-CA and L2C), but Compass signals have somewhat greater power. The notation of Compass signals used in this page follows the naming of the frequency bands and agrees with the notation used in the American literature on the subject, but the notation used by the Chinese seems to be different. The regional Beidou-1 system was decommissioned at the end of 2012. The first satellite of the second-generation system, Compass-M1 was launched in 2007. It was followed by further nine satellites during 2009-2011, achieving functional regional coverage. A total of 16 satellites were launched during this phase. In 2015, the system began its transition towards global coverage with the first launch of a new-generation of satellites, and the 17th one within the new system. On July 25, 2015, the 18th and 19th satellites were successfully launched from the Xichang Satellite Launch Center, marking the first time for China to launch two satellites at once on top of a Long March 3B/Expedition-1 carrier rocket. The Expedition-1 is an independent upper stage capable of delivering one or more spacecraft into different orbits. On September 29, 2015, the 20th satellite was launched, carrying a hydrogen maser for the first time within the system. In 2016, the 21st, 22nd and 23rd satellites were launched from Xichang Satellite Launch Center, the last two of which entered into service on August 5 and November 30, respectively. ^ May 27, Merryl Azriel on; Space, 2013 in; Relations, International (27 May 2013). "US Department of Defense Reports on China's Space Capabilities". Space Safety Magazine. ^ Clark, Stephen. "Chinese navigation satellite deployed by Long March rocket – Spaceflight Now". ^ a b "China GPS rival Beidou starts offering navigation data". BBC. 2011-12-27. ^ a b "China's Beidou GPS-substitute opens to public in Asia". BBC. 27 December 2012. Retrieved 27 December 2012. ^ "中国北斗导航卫星再次进入密集发射期". 中国新闻社. March 31, 2015. Retrieved June 16, 2017. ^ "我国成功发射第五颗新一代北斗导航卫星". 新华社. February 1, 2016. Retrieved June 16, 2017. ^ "China's BeiDou to overtake GPS". ecns.cn. ^ a b "Directions 2017: BeiDou's road to global service". GPS World. 6 December 2016. ^ Miranda, Erika (17 June 2016). "BeiDou Navigation Satellite System: China's More Accurate Version of GPS Nears Completion". Yibada English. ^ "Sky's the limit for Beidou's clients- Chinadaily.com.cn". chinadaily.com.cn. ^ PTI, K. J. M. Varma (2018-12-27). "China's BeiDou navigation satellite, rival to US GPS, starts global services". livemint.com. Retrieved 2018-12-27. ^ "The BDS-3 Preliminary System Is Completed to Provide Global Services". news.dwnews.com. Retrieved 2018-12-27. ^ "English Name of BeiDou". ^ Atkins, William (2007-02-05). "Chinese BeiDou navigation satellite launched from Long March 3A rocket". iTWire.com. Retrieved 2010-05-19. ^ "The construction of BeiDou navigation system steps into important stage, "Three Steps" development guideline clear and certain" (in Chinese). China National Space Administration. 2010-05-19. Retrieved 2010-05-19. ^ a b c "Comparable with American and Russian in terms of performance, BeiDou-1 navigates for China" (in Chinese). China National Space Administration. 2003-05-30. Archived from the original on 2012-02-12. Retrieved 2010-05-19. ^ Pike, John. "BeiDou (Big Dipper)". Space. GlobalSecurity.org. Archived from the original on 28 November 2006. Retrieved 2006-11-09. ^ a b Marks, Paul (2006-11-08). "China's satellite navigation plans threaten Galileo". New Scientist. Retrieved 2006-11-09. ^ "China puts new navigation satellite into orbit". Gov.cn. 2007-02-03. Archived from the original on 2012-02-02. Retrieved 2010-05-20. ^ a b "BeiDou 1 Experimental Satellite Navigation System". SinoDefence.com. 2008-09-24. Archived from the original on 2010-03-27. Retrieved 2010-05-20. ^ "60-day works in space -- Story of reparation of the BeiDou satellite" (in Chinese). Sohu. 2007-04-18. Retrieved 2010-05-23. ^ "Compass due Next Year". Magazine article. Asian Surveying and Mapping. May 4, 2009. Archived from the original on 19 May 2009. Retrieved 2009-05-05. ^ a b "China successfully launched the third BeiDou satellite" (in Chinese). Sohu. 2010-01-17. Retrieved 2010-05-19. ^ a b "China sends Beidou navigation satellite to orbit". Spaceflight Now. 2010-06-02. Archived from the original on 5 June 2010. Retrieved 2010-06-04. ^ "China successfully launches fifth satellite for its own global navigation network". Xinhua. 2010-08-01. Archived from the original on 3 August 2010. Retrieved 2010-08-01. ^ "China launches 6th satellite for indigenous global navigation, positioning network". gov.cn. 2010-11-01. Archived from the original on 31 December 2010. Retrieved 2010-11-21. ^ "Beidou Launch Completes Regional Nav System". GPS World. 2010-12-06. Archived from the original on 2012-03-12. Retrieved 2011-12-23. ^ "China joins EU's satellite network". Business News. BBC News. 2003-09-19. Retrieved 2006-11-09. ^ "First contracts of the Galileo project signed, China is to invest 200 million Euro" (in Chinese). Xinhua. 2005-07-29. Archived from the original on 2010-02-11. Retrieved 2010-05-26. ^ "About us". China Galileo Industries. Archived from the original on 2011-07-07. Retrieved 2010-05-26. ^ "Eleven projects within the China-EU Galileo project have been signed and are carrying out" (in Chinese). Xinhua. 2006-04-13. Archived from the original on 2011-07-19. Retrieved 2010-05-26. ^ "South China Morning Post: China is not going to be the little partner of the Galileo project" (in Chinese). Global Times. 2008-01-03. Archived from the original on 2011-07-12. Retrieved 2010-05-26. ^ "SOLAS amendments to make IGF Code mandatory approved by Maritime Safety Committee". Maritime Safety Committee (MSC), 94th session, 17–21 November 2014. International Maritime Organization. 26 November 2014. Retrieved 7 April 2015. ^ Feng, Bruce (4 December 2014). "A Step Forward for Beidou, China's Satellite Navigation System". The New York Times. ^ "Chinese Beidou Navigation Satellite System officially into Global Radio Navigation System". BeiDou. 1 December 2014. ^ Barbosa, Rui C. (30 March 2015). "Long March 3C in secretive launch with new Upper Stage". NASASpaceFlight.com. ^ a b c "China successfully launched the first New-Generation Beidou Navigation Satellite". BeiDou. 1 April 2015. ^ Goebel, Greg (2008-09-01). "International Navigation Satellite Systems". vectorsite.net. ^ "BeiDou navigation system first goes to public, with resolution 0.5 metre" (in Chinese). Phoenix Television. 2007-07-18. Archived from the original on 2009-02-27. Retrieved 2010-05-19. ^ "BeiDou Products". BDStar Navigation. Archived from the original on 2009-01-05. ^ "BeiDou-1 commercial controversy: 10 times the price of GPS terminal" (in Chinese). NetEase. 2008-06-28. Retrieved 2010-05-23. ^ "Why is China's Beidou terminal so expensive?". PRLog. 2008-08-31. Retrieved 2010-05-29. ^ "3000Yuan BeiDou Satellite Positioning System terminal solution was presented at ELEXCON" (in Chinese). eetrend.com. 2009-11-17. Archived from the original on 13 May 2010. Retrieved 2010-05-29. ^ "Hongkong report: BeiDou-1 played an important role in rescuing, 7 nations providing free satellite data" (in Chinese). Sohu. 2008-05-20. Retrieved 2010-05-23. ^ "BeiDou-1 has equipped Yunnan troops, leading to command reform" (in Chinese). Sohu. 2009-10-14. Retrieved 2010-05-23. ^ "China To Set Up Independent Satellite Navigation System". SpaceDaily.com. 2010-05-24. Retrieved 2010-06-04. ^ "The Logo Image of BeiDou Navigation Satellite System Issued". BeiDou.gov.cn. 2012-12-27. ^ "China Launches Another Compass GEO Navigation Satellite". Inside GNSS. 2010-06-02. Retrieved 2010-06-04. ^ "Introduction of the BeiDou Navigation Satellite System" (in Chinese). BeiDou.gov.cn. 2010-01-15. Retrieved 2010-06-04. ^ "Precise orbit determination of Beidou Satellites with precise positioning". Science China. 2012. Retrieved 26 June 2013. ^ "GPS rival Beidou will cover Asia Pac by end of the year". The Register. 17 May 2012. Retrieved 26 June 2013. ^ "US Department of Defense Reports on China's Space Capabilities". Space Safety Magazine. 27 May 2013. Retrieved 26 June 2013. ^ "China will make BeiDou Navigation Satellite System available to global users by 2020". Next Big Future. 28 June 2016. Retrieved 3 February 2017. ^ Levin, Dan (2009-03-23). "Chinese square off with Europe in space". China: Nytimes.com. Retrieved 2011-12-30. ^ "Satellite navigation system launched". China Daily. 28 December 2010. Retrieved 29 December 2011. ^ "China GPS rival Beidou starts offering navigation data". BBC. 27 December 2010. Retrieved 29 December 2011. ^ "5+5+4"这样的星座结构有什么特点？ (in Chinese). WWW.BEIDOU.GOV.CN. 2012-12-26. Retrieved 2013-01-03. ^ "China launches 10th satellite for independent navigation system". Xinhua. 2011-12-02. Retrieved 2011-12-23. ^ "BeiDou navigation system covers Asia-Pacific region till 2012" (in Chinese). Xinhua News Agency. 2010-03-03. Retrieved 2010-05-19. ^ "A digital Silk Road". Retrieved 2017-12-03. ^ a b Update on the BeiDou Satellite Navigation System. 12th ICG Meeting. Jia-Qing Ma, China Satellite Navigation Office. ^ "European radio navigation plan (ERNP)".